It is hard to tell the adult Ant Damsel Bug apart from similar species. 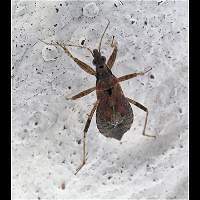 Himacerus apterus for instance is almost identical, but actually has shorter antennae. It is a good way of telling these species apart. The one with antennae shorter than its body or exactly the same size is the Ant Damsel Bug. 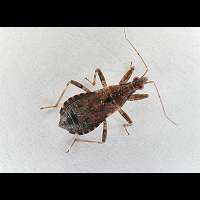 Should the antennae be longer than the animal's body, you are holding a Himacerus apterus. The wings are usually not fully developed and very short. Occasionally though the wings are fully grown, but even animals with fully grown wings are not capable of flying. 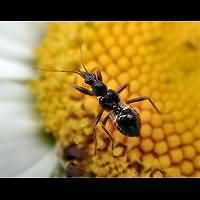 Adult animals are some 7 to 9 mm long. 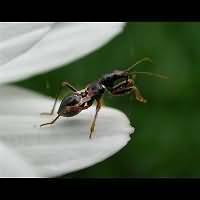 The larvae can be identified with great ease: they look like rather big ants. 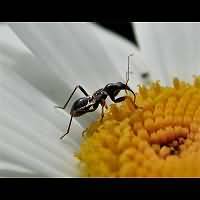 Because birds and other predators seldomly hunt for ants the larvae behave inconspicuously by sitting on top of flowers. There they hunt for other insects. Even flies bigger than themselves are being attacked. When attacking they assume a threatening position, not unlike the Praying Mantis's. The Ant Damsel Bug is active by night and by day. The adults appear in September and overwinter. The eggs are being laid in April, they usually hatch by the end of May or in June, which is by the time the last adults die. The larvae are seen in July and August especially.